In pushing for the Obama Administration’s approval of TransCanada’s proposed Keystone XL tar sands pipeline, the North American oil industry and its political patrons argue that the pipeline is necessary for American energy security and its construction will help wean America of dependence on Mideast oil. But a closer look at the new realities of the global oil market and at the companies who will profit from the pipeline reveals a completely different story: Keystone XL will not lessen U.S. dependence on foreign oil, but rather transport Canadian oil to American refineries for export to overseas markets. A new report from Oil Change International lays out the case, based on data and documents from the U.S. Energy Information Administration and the Canadian National Energy Board, corporate disclosures to regulators and investors, and analysis of the rapidly shifting oil market. 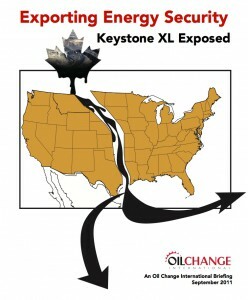 Keystone XL is an export pipeline. The Port Arthur, Texas, refiners at the end of its route are focused on expanding exports to Europe, and Latin America. Much of the fuel refined from the pipeline’s heavy crude oil will never reach U.S. drivers’ tanks. Valero, the key customer for crude oil from Keystone XL, has explicitly detailed an export strategy to its investors. Because Valero’s Port Arthur refinery is in a Foreign Trade Zone, the company can carry out its strategy tax-free. In a shrinking U.S. market, Keystone XL is not needed. Since the project was announced, the oil industry acknowledges that higher fuel economy standards and slow economic growth mean declining U.S. oil demand, even as domestic production is booming. Oil from Keystone XL will therefore displace American crude from new, “unconventional” domestic fields in Texas or North Dakota. Valero has contracted to take at least 100,000 barrels of tar sands crude a day from Keystone XL until 2030. It’s publicly disclosed business model relies on refining heavy sour crude for export. It is upgrading its Port Arthur refinery to process heavy sour into diesel fuel. Its investor presentations clearly show it plans to ship diesel to Latin America and Europe. Valero – the Texas independent behind last year’s attempt to overturn California’s clean fuel standards – is the only U.S. company among the six customers who have jointly committed to purchase 76 percent of Keystone XL’s initial capacity. The other refiners are Shell, which is part of Motiva, a joint venture between Royal Dutch Shell and the Saudi government, and Total of France, both of which have newly upgraded facilities in Port Arthur tax-free trade zones. There are also two Canadian producers and one international oil-trading firm in the group of six customers. IF this were for the benefit of the American people to bring prices down and within reason I would understand however, it is not! It is oil meant to go outside the USA for Valero & their cronies to fullfill their greed filled needs as well as cheating the American people out of paying their share of taxes. RE “The only way to truly reduce our dependence on foreign oil is to reduce our dependence on all oil”. Absolutely! Also, the only way to create a healthier and more sustainable Earth for all living things is to reduce our dependence on all oil. My question is not “will Obama fall for it,” but does Obama not already know this? IF you know it, is it possible he’s in the dark? And isn’t it interesting that Transcanada’s main lobbyist was a major aide on Hillary Clinton campaign? I voted for Obama, I want to believe he’ll do the right thing. He’s a very savvy man. I find it hard to believe he doesn’t have this info. And if he doesn’t, I hope you have a way to get it to him! The President and his administration have lied about the pipeline. It’s time to use those strong words and continue a campaign of disobedience to such evil behavior. Let’s not be party to this travesty! The sooner we get away from Oil, The better this country will be. They claim “we need the energy” yet we all know “They need the $$$$” and we will see little of the oil. We are not the idiots you take us for. I’m building an electric car. You should too. No. We cannot fall for this. The Keystone Pipeline is not the answer. Oil companies got to understand the importance of renewable energy sources. Why no mention of the toxic, polluting process required to take the tar sands oil and make it into something useable. And why don’t the Canadians process the oil in Canada? I would rather have our efforts placed in alternative energy sources which will be a new area for job creation. Also, we need to put more emphasis on educating folks about the importance of using less, conserving more and, moving towards alternative energy souces. That’s a future good for all Americans. HURRAY FOR DARYL HANNA STANDING UP FOR MOTHER NATURE ‘S FUTURE AND PROTECTING THE FUTURE CHILDREN FOR CLEAN ENVIRONMENT. THANK YOU GUYS for putting your lives on the line by demonstrating on all our behalf. If I could afford it I’d go to DC too. Some existential disasters take many years before the trap closes. Then the teeth clamp the land for centuries more, tearing down what we’d built up. Mr. President, take down this pipeline barrier to life. Stop the export market tar oil now, and also coal and natural gas and biofuels – they all combine carbon with oxygen to make global heat containment byproducts, and we don’t even do a good job to use power plant coolant energy and point-of-use exhaust energy as we push our changed climate and poisons into the lives and lungs of our children, grandchildren, and the generations to come. It’s hard to think of the future when the present hounds you and bays for your favor today. But do it – stop the tar oil. There is nothing to like about KeystoneXL. As a dangerous “upgrade” to current Keystone pipeline, it would use extra thin wall and extra high pressure to drive the bitumen fluid to the refineries on the Gulf Coast and then out to the world market. My own analysis at LastTechAge.wordpress.com. The amount is not enough to add to either US or international consumption, is incredibly dangerous in its path, and as you say, is meant to divert Canadian petroleum from U.S. use to world sales. We all know Obama has abandoned EVERYTHING he used as a campaign mantra in 2008, so we all know he delayed his decision until AFTER the 2012 election because he WILL sign it. for bringing it to the public’s attention that the oil from this pipeline will not be used in the US. The American people need to know the truth and we need to all contact the President and our representatives and put the pressure on them to stop this pipeline. Hey, isn’t it good that we can export something? If petroleum is a global commodity, how can it not Help us. printing out a backup to demonstrate to my personal pals. The governments around the world and in US not exploring solar power as sustainable and pollution free fuel.Its just greed and hypocrisy prevailing because at the end of the day all they care about is money. Earth is being killed slowly and humans will pay a heavy price. What these elected governments do is just a reflection of collective human consciousness / mindset – purely selfish. Sad. Why do Democrats & liberals keep giving him a “pass”? Is it just because he’s a Democrat? Or is it because he’s our first African American president? SO WHAT! He doesn’t seem to be protecting our climate, planet, or country’s interest–name it and call HIM out on this! And don’t tell me that Romney would’ve been worse! Right NOW President Obama is getting away with murder on so many fronts & blind Dems & liberals are following him over the cliff like so many lemmings! PLEASE WAKE UP. if you wouldn’t want one running through your living room, you shouldn’t want one running through your country.